Strong Northern winds up to 8B in the Aegean sea have not hindered refugees from reaching the shores of Lesvos island, especially in Sykamia and Eftalou. 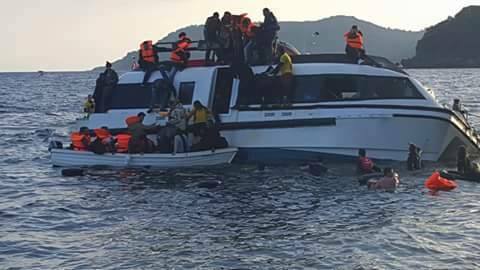 Yet the weather conditions -close to 5C degrees at night and the strong winds- have taken their horrible toll: three shipwrecks (28,29 and 30 of Oct. close to Lesvos, Kalymnos and Rhodes islands) claimed 39 lives, most of them children. The fall has come and the fear of many volunteers has been proven valid. The smuggling network from Turkey does not hesitate to force refugees into the inflated dinghies even when it is obvious that seas are too rough. Talking with Syrians at Sykamia makes it evident that they have an extremely vague idea as to the means of their passage to Europe, what expects them in open waters, how to stir the boat, or how to protect themselves. The smugglers claim that nothing much can happen and that the very number of casualties compared to the great numbers of refugees that made the trip safely proves exactly their point. Yet, there are many refugees –especially those who utilize internet sources to prepare or continue their journey – that hesitate. Their hesitation leads them to what is presented as ‘safer means of passage’, namely old wooden or plastic boats (which of course cost considerably more). These vessels might seem safer but in reality they pose a worse danger yet. Smugglers fit more refugees in a single boat thus maximizing profit but also the risk for a shipwreck. The shipwrecks in Lesvos and Kalymnos have a common characteristic: they happened to the ‘safer type’ of boats all of which travelled in rough weather. Those supposedly ‘safer boats’ are full of structural defaults and sold to smugglers by locals at a fraction of their price. The photo depicts such a boat (‘catamaran’ type) that barely made it to Sykamia this week. Midway, it filled with water and leaned on one side causing panic to the refugees on board. 120 refugees barely made it this time. Volunteers helped them disembark almost 100 meters before reaching the shore.